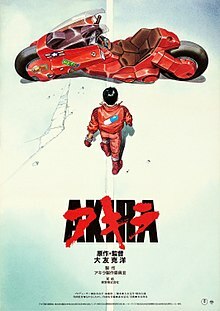 This week the screening we watched was the film Akira (1988) which is a Japanese animated post apocalyptic Sci-Fi film. The film has received critical acclaim over the years and is widely considered to be one of the greatest animated and Sci-Fi films ever made. Prior to watching this, I haven’t been exposed to much anime, only ‘Ghost in The Shell’ that we watched in BCM 241. However as a kid I did watch Pokemon a lot and I also was into cartoons. So Akira is the second anime film I would be exposed to. Ghost in the Shell was a very fascinating and enjoying watch for me. Viewing the movie I was surprised on how much I immediately engaged with it. I thought it would be somewhat foreign to me, but the graphics themselves as well as the english overdubs, I didn’t really need to adjust to the movie as much as I did with watching Godzilla. I must admit the english overdubs did help me a lot and made it more familiar to me. The story of it is also not as foreign as I expected, the plot almost seems like that of a Western movie, so it’s very accessible. I love the style of the animations, and honestly can say if I didn’t now the film was made in 1988, I would’ve thought it was recent. There’s also nothing which grounds the film in 1988, 30 years ago, because the plot and themes, are still relevant and used in films today. If there’s one thing about Akira that is certain, is that it is Timeless. I also really loved the soundtrack of the movie, it is absolutely beautiful. All in all, I absolutely loved the movie. I was very surprised how well I engaged with the movie, and didn’t need to step out of my comfort zone to immerse in it. Another part of this week was reading an article Ellis At Al (2011) which is an in depth run down of what exactly Auto-ethnography is. What is delved into is the history, the process, and the results, as well as the criticism of it. The very first sentence sums it up: “Autoethnography is an approach to research and writing that seeks to describe and systematically analyze (graphy) personal experience (auto) in order to understand cultural experience (ethno)”. It is essentially the coming together of autobiography and ethnography. This is exactly what we did in our first blog post responding to Godzilla, the context of it, and how we perceive it based on our own experiences. So through that, I’ve already done Auto-ethnographic work. The most interesting part of the article was the “Potentials, Issues and Criticisms” which detail some of the forms and approaches of auto-ethnography such as Indigenous/Native, reflexive, narrative, layered accounts, interviews and more, which was good. The different approaches really helps you figure out how to immerse in auto-ethnographic research and which methods are best for which situations.